This desirable villa is new on the market and priced to sell. This Pre-1974 Turkish Title Deed villa is located on the outskirts of Iskele village is within walking distance from the beach and the village center. The property consists of a large kitchen/diner, lounge, three first floor double bedrooms and a fourth bedroom on the ground floor. The 10m x 5m overflow swimming pool and barbecue area are set in the pretty easily maintained gardens. The internal covered area is approximately 170m² and the property is on a large corner plot. Close to the picturesque harbour in Bogaz and just 20 minutes from Famagusta town, the new Karpaz Gate Marina is a 30 minute drive down the coast road and the up and coming resort of Bafra is just a short drive away, both Ercan and Larnaca airports are within easy reach. 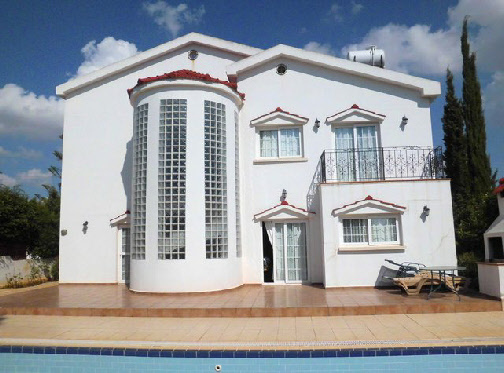 This superb villa has just been subjected to a promotional discount of a massive £29,950 . At this extremely competitive price no further reduction will be considered. First deposit will secure this really hot deal. This impressive entrance hall with an attractive curved staircase, glass wall has a galleried ceiling and doors leading to the rear terrace, Cloak room and Ground floor bedroom. The kitchen has been fitted with modern units and integrally fitted fridge/freezer, and includes a dishwasher and washing machine. French doors lead to the hallway enabling the kitchen to be closed off from the rest of the house. Sliding patio doors lead to the rear garden and pool. A light and airy room including a corner fireplace, and patio doors leading to the front terrace with French doors to the hallway. This room has a window which looks over the side of the property and patio doors opening onto the front terrace this room could also be used as a dining room or study. Guest bathroom with WC, wash basin and shower, tiled throughout in marble. The attractive curved marble staircase makes use of the natural light from the glass brick curved wall, the stylish landing area has an oval gallery looking down to the hallway. An extremely attractive room with patio doors leading to rear balcony overlooking the swimming pool and garden. Fitted with wash basin, WC, shower unit and tiled throughout with marble. A double bedroom with patio doors leading to the balcony where access to the roof terrace can be made. This huge bathroom is tastefully decorated and is fitted with top of the range bathroom fittings including a corner bath with shower over and marble tiles throughout. Accessed via a spiral staircase from the second bedrooms balcony, and with attractive views of the mountains. External Features An attractive arched entrance with wrought iron gates takes you into the garden that has a wall to the front and sides of the property and a gated private driveway. There is a built in barbecue area and a large tiled outdoor terrace with a beautiful roman ended overflow pool. All this is set in the pretty landscaped garden, the lush mature shrubs and trees give privacy to the pool and garden. The busy and friendly large village of Iskele is well supported by a good number of shops and other services and there is a modern supermarket a short distance along the coast road towards Bogaz. The area in general including the long stretch of sandy beaches that comprise the Long Beach area, is the centre of much investment activity and we believe that this is an excellent time to invest in property here.